In Australia we celebrate Father's day on the first Sunday of September. It was a beautiful day to be outside, and that is exactly what we did. After enjoying a nice family breakfast at Alex's sisters house we headed over to the bay side for a picnic. Everyone else seemed to have the same idea so it was a little hard finding a car park, but we got one in the end. The sky was clear and the water was blue! We set up our rug and spread out our food. Mikayla was keen to explore but managed to sit down and eat a little of her sandwich with Mummy and Daddy. After lunch we packed up and went for a walk around the bay, much to Mikayla's pleasure. I wanted to get some nice photos of Mikayla and Daddy on his special day, and I managed to capture a couple of nice ones to share. I have been obsessed with making these delicious fruity ice drinks lately. They are so quick and easy, and so many variations you can try out to suit your own taste. The one pictured above is one of my raspberry, watermelon and lemon creations. I have also made pineapple and passion fruit which was just as good. Put all ingredients into a blender and blend until well combined. 24 weeks pregnant... a little late. So I am actually 26 weeks and 4 days pregnant as I write this post, but I really wanted to share a pic from my 24 week photos (courtesy of my Mum). I will try get a current photo in the next few days. I just really like this photo because Mikayla is in it and is touching my belly. I can't wait till she has a little sister. We tell her all the time that there is a baby in Mummy's tummy and she kisses and hugs it all the time, but I just don't know if she really gets it. She can definitely see my belly growing and points it out all the time. I would love to know what she is thinking. I often wonder and worry how she will be once the baby is actually here. It has been just the three of us for so long now, and she is so use to getting our full attention. She is such a gentle and caring girl, so I am not worried about her being rough or mean, I just worry that she will take it out on me and make me feel guilty. It will definitely be a learning curve in different ways this time round. I am looking forward to it though and can't wait to hold my baby girl. I would love to know how you told your children there was another baby on the way, and how they took it once baby was born. I found the recipe for these cookies over at Kitchen Addiction. They are soooo good and so easy to make. I just had to share them with you. They have a chewy consistency which I love! Changes made from original recipe - I used plain flour instead of whole wheat flour, and I may use a few more oats next time. Pre-heat oven to 175c and line baking tray with baking paper. In a bowl mix flour, baking soda and salt. Set aside. With an electric mixer, mix butter, peanut butter, sugars and vanilla extract. Cream together until light and fluffy. Add egg and beat until combined. Slowly add in flour mixture on low speed until just combined. Stir in oats and choc chips. Place heaped teaspoons of dough mixture onto baking tray. Leave about 2 inches in between each cookie. Bake for 8-10 mins or until just turning light golden brown. Do not over bake! Allow cookies to cool for 5 mins before transferring to a wire rack to cool completely. I wish I knew where this recipe came from so I could give credit, but it was just one of those posts passed around Facebook that I grabbed and wanted to share. I love making stuff like this myself as I know exactly what goes into it. 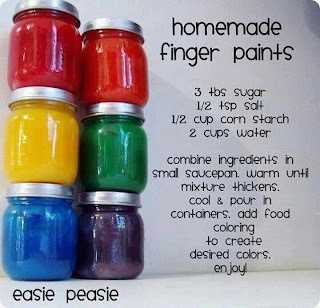 This recipe is great because it's all non toxic and completely edible, it doesn't matter if little miss has a taste (and you know she will). By the way, when do kids grow out of the "everything goes in the mouth faze"? My mum use to make us home made play dough which was always hours of fun. I will definitely have to ask for that recipe in the near future. 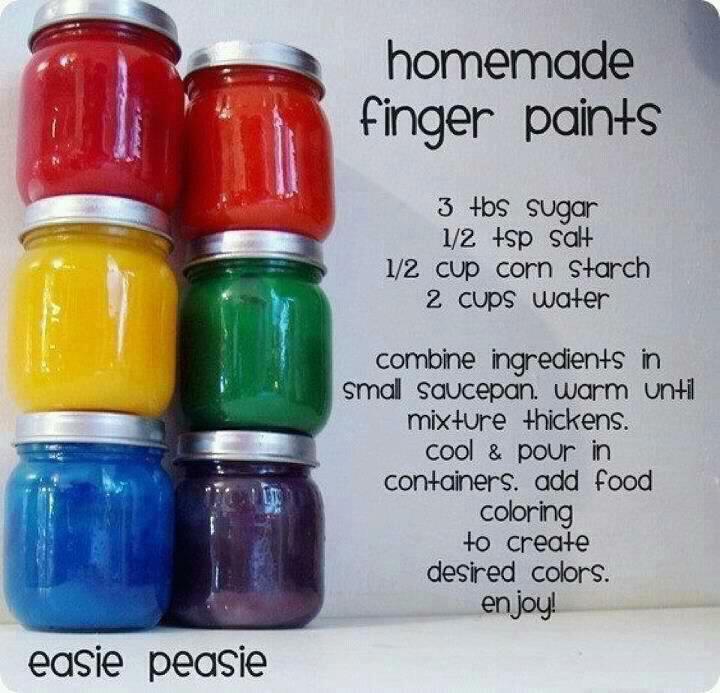 Have you got any easy recipes like this that you make for your kids to play with? 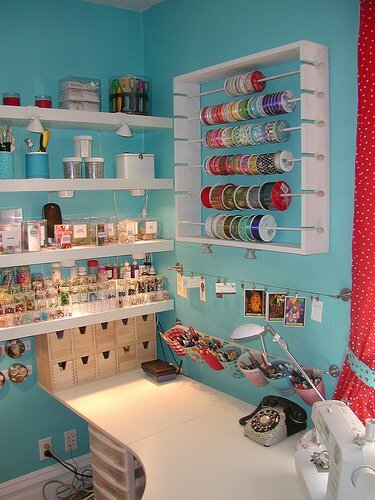 to own my own home right now. Have you ever had so many creative thoughts racing around your head, just dying to get out, but there is nothing you can do about it? That is how I feel at the moment. I want to do so much creatively to my home and to my life, but living in a rental home stops me from doing any of it. I don't know where this motivation is coming from at the moment, but I feel like I need to make the most of it. I just wish I knew how. I know the only way Alex and I will be able to afford our own home any time in the near future is for me to go back to work, but I just can't imagine leaving my babies. Just the thought breaks my heart. I feel like I was the one who brought them into this world and it is my job to look after them, not someone else. It is such a tug of war for mothers these days. On one hand you want to provide stability and the necessities and on the other you're the one who wants to be there to teach, to love and to comfort. I just wish I had the answers. One day I know we will get there, but for now I will make the most of what I have and do the best I can. 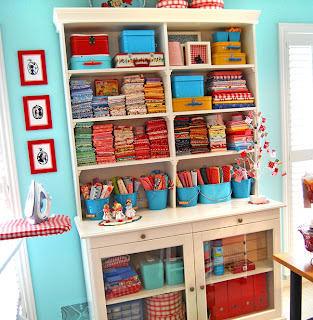 I don't know what it is at the moment, but I have an overwhelming need to craft and sew. Maybe it's the nesting faze of my pregnancy setting in, I'm not sure, but I haven't been this motivated in a very long time. It's funny how quickly you realise just how precious time is after you have kids. So many things needing and wanting to be done, but just no time to do them in. Sure I could sit down and begin a project, but I am most definitely going to be interrupted and distracted by that cute faced daughter of mine, who is always interested in what Mummy is doing. Most of the time I try and get a bit of crafting done during her 1 hour a day nap, and so far so good. I have managed to do a couple of projects that have been playing on my mind for a while now. 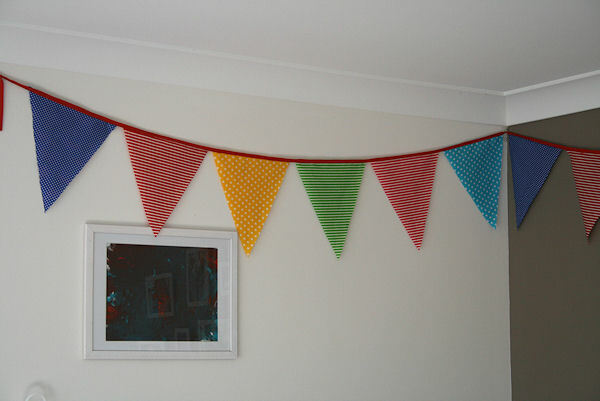 A quick bunting made for the playroom. A quick tiered skirt with matching hair clip. Simple skirt thrifted from an old top of mine. Everything I've made so far has been very quick and easy to do. I would love to do a more in depth post on each of my projects and a quick run through of how they are done, but once again, Mikayla only spends a short amount of quite time eating her lunch before I hear the words "done!". 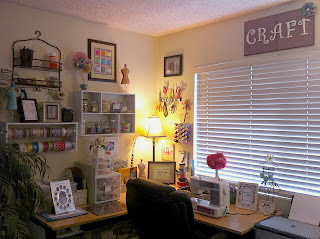 I am also wanting to do a whole re-vamp of my blog and it's layout. So you may notice a few changes over the next couple of weeks as I try to do what I can in my left over "free" time. Come with me as I embark on a journey through the ups and downs of being a first time Mum. 35 weeks and 3D scan! 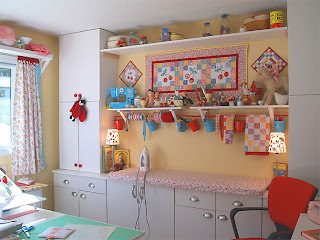 All contents of this website are Copyright © 2010-2012 Michelle Hallmond. All rights reserved.